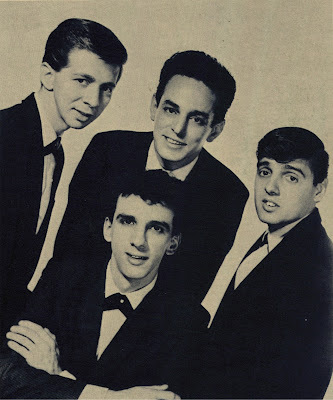 White group from the Bronx consisted of Louis "Donnie" Burgio (Lead), Peter "Pete Alonzo " Vecchiarelli(Bass),Andy Catalano(Tenor) and Frank Furstaci(Baritone). 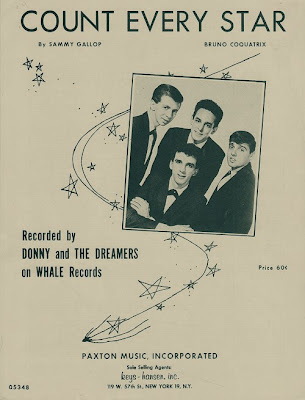 In 1961 they recorded for Whale Records the sides_Count Every Star/Dorothy. the A side a Raven's 1950 side charted #35 in the Billboard list. This same year the label release one side DJ single with the tune_Life Is A But A Dream. under the group name of Kenny & The Whalers. In late 1961 the group recorded again on Whale with their original name_My Memories Of You/Teenage Love. and again the A side (an uptempo version of a 1954 ballad of The Harptones) charted in the Billboard list #79. Finally the label sold the Dreamer's masters to Decca Records and this label released one single_Carole/Ruby My Love. The group have unreleased sides as_Heaven Only Knows. 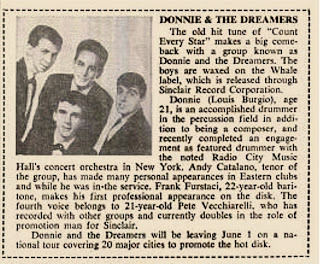 Andy is the little brother of singer,songwritter and producer Vinny Catalano(see in this blog),Vinny used to Donnie & The Dreamers as his back up studio group and recorded in 1961-62 many unreleased sides as_I Won't Cry Anymore/Because Of You. for this work the group were know by Vinny as VINNY & THE DREAMS or THE DAY DREAMS.